However, none of these were legal options either, according to ACE. A few weeks ago the rightsholders asked the court to intervene but, before it could, the parties agreed on a settlement, as reported here last week. Initially, no details about the nature of the settlement were released, but a proposed order that was just submitted in the California federal court shows that the defendants agreed to a rather significant damages award. “Judgment shall be entered against Defendants and in favor of Plaintiffs on Plaintiffs’ claims of copyright infringement, and damages shall be awarded to Plaintiffs in the amount of US $14,500,000,” it reads. In addition to paying damages, the defendants are permanently prohibited from infringing the copyrights of ACE members. 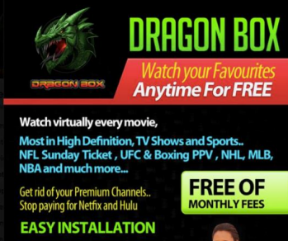 This includes operating and offering the Dragon Box for sale, as well as offering BlendTV, My TV Hub, or similar subscriptions. ACE spokesperson Richard VanOrnum welcomes the consent judgment, characterizing it as an important victory. “Today’s legal victory is another significant and positive step in reducing online piracy and supporting creators around the world. ACE is pleased the agreement will ensure the immediate shutdown of the illegal Dragon Box system. “The theft of creative content is a pervasive threat to the dynamic legal marketplace for movie and television content, and ACE will continue its global efforts to advance creativity,” VanOrnum adds. Whether the defendants will be able to pay the $14.5 million has yet to be seen. It will, however, act as a stark warning to other box vendors. At the time of writing, the official Dragon Box website redirects to a website selling CBD oil and related products. This is the second major streaming box settlement for ACE. Last year it made a similar deal with TickBox TV, which agreed to cease its activities and pay $25 million in damages. A copy of the proposed consent judgment and permanent injunction is available here (pdf).